Southern style wing sauce. 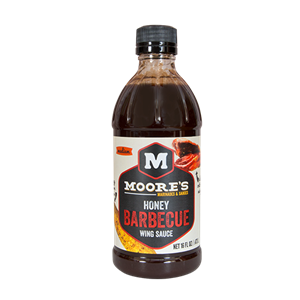 A smoky barbecue flavor with a touch of sweet heat. Soak for a quick marinade, drench for a down-home dip. High fructose corn syrup, tomato paste, water, honey, distilled vinegar, salt, sugar, ground black pepper, jalapeno pepper, ground paprika, onion powder, modified food starch, ground red chili peppers, granulated garlic, natural smoke flavor, sodium benzoate, potassium sorbate (added as preservatives), caramel color, natural chipotle flavor.